The historical separation between Judaism and Christianity is often figured as a clearly defined break of a single entity into two separate religions. Following this model, there would have been one religion known as Judaism before the birth of Christ, which then took on a hybrid identity. 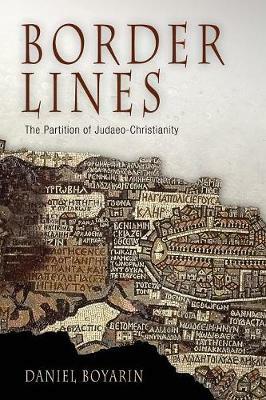 Even before its subsequent division, certain beliefs and practices of this composite would have been identifiable as Christian or Jewish.In Border Lines, however, Daniel Boyarin makes a striking case for a very different way of thinking about the historical development that is the partition of Judaeo-Christianity. There were no characteristics or features that could be described as uniquely Jewish or Christian in late antiquity, Boyarin argues. Rather, Jesus-following Jews and Jews who did not follow Jesus lived on a cultural map in which beliefs, such as that in a second divine being, and practices, such as keeping kosher or maintaining the Sabbath, were widely and variably distributed. The ultimate distinctions between Judaism and Christianity were imposed from above by "border-makers," heresiologists anxious to construct a discrete identity for Christianity. By defining some beliefs and practices as Christian and others as Jewish or heretical, they moved ideas, behaviors, and people to one side or another of an artificial border-and, Boyarin significantly contends, invented the very notion of religion.